It is an exciting time to be at Auburn, a university with a bold vision for the future. We are becoming even more renowned for helping our students achieve their dreams, solving society’s pressing problems and improving lives in Alabama and beyond. Auburn is on the move to reaching its full potential as one of the nation’s leading land-grant universities — and making a meaningful difference in our world. Steven Leath became Auburn University’s 19th president on June 19, 2017. Supporting Auburn’s vision to inspire, innovate and transform, Dr. Leath is focused on strengthening the institution’s reputation as a partnership university and empowering students, faculty and entrepreneurs to develop transformative ideas and inventions that improve lives. Key initiatives he has advanced since arriving at Auburn include a plan to recruit 500 research- and scholarship-focused faculty, the advancement of multidisciplinary research through a $5 million presidential award program and new fellowships to attract top-tier PhD scholars. Under his leadership, Auburn achieved Carnegie R1 classification, placing the university among the country’s elite research institutions. 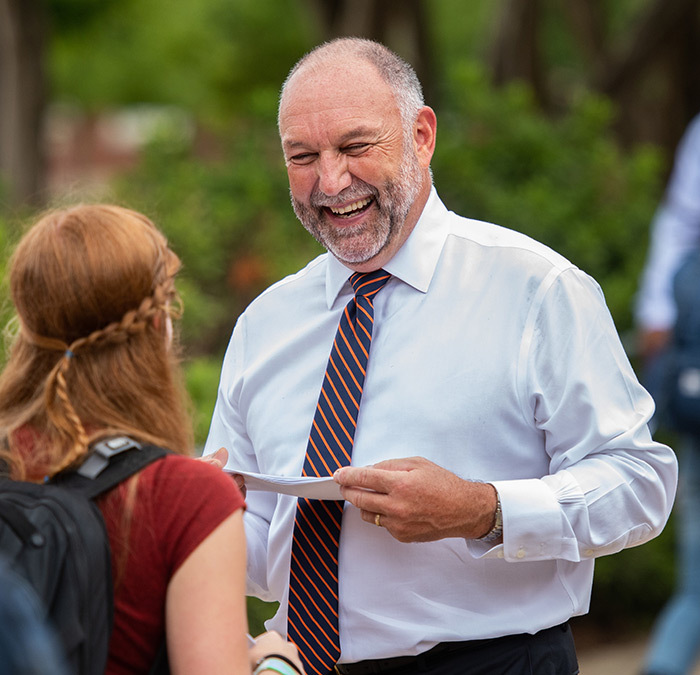 Auburn is renowned for its exceptional student experience, and Dr. Leath champions programs that position Auburn students to become leaders in their professions and engage in their communities. Prior to arriving at Auburn, Dr. Leath served as president of Iowa State University and vice president for research and sponsored programs for the University of North Carolina System, and he held several prominent positions at North Carolina State University. Dr. Leath holds a BS in plant science from Pennsylvania State University, MS in plant science from the University of Delaware and PhD in plant pathology from the University of Illinois. In 2018, Dr. Leath was appointed by President Donald J. Trump to serve a six-year term on the National Science Board. He also serves as Secretary of the Council of Presidents for the Association of Public and Land-grant Universities. Dr. Leath and his wife, Janet, have two sons, Eric and Scott, and two yellow Labrador retrievers, Quill and Fraser. Auburn University announced it had received $100,000 from the Southeastern Conference, a donation it said would be put toward supporting students, faculty and staff affected by the tornadoes. Auburn University reached an important status recently when the Carnegie Classification of Institutions of Higher Education named Auburn to its category reserved for doctoral universities with the highest level of research activity. At Auburn, we have set our sights on a brighter, more prosperous future. We have a strong partnership with the state of Alabama, and working together, we will realize our shared goals for our state. In another affirmation of its drive forward to excellence, Auburn University achieved a research milestone Monday - being elevated to an “R1” institution by the Carnegie Classification of Institutions of Higher Education. The announcement follows a concerted effort by Auburn to elevate its commitment to life-saving research, most prominently with an announcement by Auburn President Steven Leath in December 2017 and subsequent awarding of $5 million for three years toward the Presidential Awards for Interdisciplinary Research, or PAIR. An R1 designation by Carnegie is reserved for doctoral universities with the highest levels of research activity. Auburn is on the move as a thought leader and partnership university, with a federal announcement Monday placing Auburn at the center of national policy matters involving science, engineering and education in both subjects. The latest comes as Auburn President Steven Leath was among just seven leaders appointed by President Trump to the National Science Board until May, 2024. Auburn University is helping launch a massive new effort in which 130 public universities and systems will work together to increase college access, close the achievement gap and award hundreds of thousands more degrees by 2025. The participating institutions will work within “clusters” of four to 12 institutions as they concurrently implement innovative and effective practices to advance student success on their campuses. Collectively, the institutions enroll 3 million students, including 1 million students who receive Pell Grants. The Association of Public and Land-grant Universities (APLU) has organized the collaborative effort, known as Powered by Publics: Scaling Student Success. Auburn University President Steven Leath has been appointed to a three-year term as Secretary of the Council of Presidents of the Association of Public and Land-grant Universities (APLU). Leath’s role as Secretary will be part of the Executive Committee of the APLU Board of Directors, which helps set policy goals and priorities for the association. The Council of Presidents is composed of the chief executives of member colleges and universities and systems. Under the organization of the council, chief executive officers develop a working agenda and programs. NBC Nightly News spotlighted Auburn’s partnership with Delta to address a real-world challenge: a nationwide shortage of pilots. The university was selected by Delta to launch the Delta Propel Pilot Career Path Program, an initiative that aims to identify, select and develop the next generation of pilots. The nation’s top law enforcement official, U.S. Attorney General Jeff Sessions, visited Auburn University on Friday to examine two Auburn initiatives designed to protect the public—one focused on the national opioid crisis and the other involving the world’s most advanced detector dogs. Sessions began his tour Friday morning at the Harrison School of Pharmacy, being offered a presentation on Auburn’s approach to effective opioid response and treatment. Thanks in part to a continued influx of manufacturing investment and its steady flourishing of its digital capabilities, Alabama continued its climb up the 2018 Chief Executive Best States and Worst States for business rankings, to No. 17 from No. 19 last year and from as low as 24 in 2015. The President’s Office welcomes questions, concerns and feedback. Submit your message using the form below, and a staff member will contact you as soon as possible. If you are interested in having the President attend or speak at your group’s event, complete and submit the appearance request form.